With a new year comes new hot hotel openings and we’ve rounded up some of the best to keep an eye out for. A gorgeous boutique hotel in Palma’s Old Town, Palacio Can Marques inhabits one of the city’s most historic properties dating back to 1760. The 13 individually designed suites follow the layout of the old Palacio structure, making each one unique in shape and décor. Lovingly restored by French interior designer Aline Matsika, Palacio Can Marques is a passion project led by owner and visionary Kim Schindelhauer, who has now opened up the Palace’s doors to guests for the first time in 250 years. Designed to evoke the feel of a spectacular private home, Matsika has drawn on existing architectural details including Moorish tiles and Binissalem stone for inspiration. Ornate furniture, contemporary art and custom made lighting from Murano all create a stylish yet comfortable vibe. At LUX* North Male Atoll, contemporary whitewashed penthouses will replace the thatched-roof water villas that have become definitive of Maldivian luxury. With every villa equipped with a roof deck, LUX* offers guests the chance to host dinners parties, set up a private cinema, learn about astrology or be taught to take photos of the night skies, all in the privacy of their own penthouse. The contemporary aesthetic, elegantly styled by Singaporean design group Miaja, evokes a Miami art deco feel. 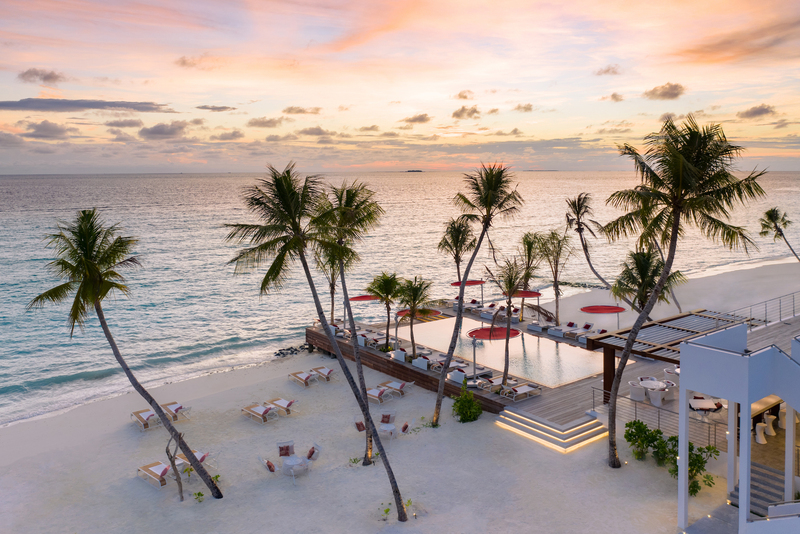 LUX* North Male Atoll will also offer numerous restaurants and bars, activities for all ages, and will be complete with the LUX* Me Spa. Villas rates: start from £1,940 per night for a couple on an all-inclusive basis, including transfer. Inspired by the regal, grand designs of 18th century continental Europe, the Emerald Palace Kempinski Palm Jumeirah offers palatial luxury with a contemporary twist. Comprised of 389 guest rooms, villas and suites, the Emerald Palace will offer the largest lead-in room category on Palm Jumeirah. The hotel will offer a 500m private beach, lagoon pool, Cinq Mondes spa facilities and 8 exclusive culinary experiences, including Mix Restaurant by Michelin chef Alain Ducasse. The latest addition to the line of five-star Kempinski hotels, the 475 room Apurva Kempinski Bali presents itself as a majestic open-air theatre. Set amidst the dramatic cliffs and immaculate beaches of southern Bali, the resort positions itself around the themes of the spectacular, sensational, curated and serene, focusing on multi-platform experiences in order to make The Apurva Kempinski Bali the ‘Place to Discover’. Facilities include an ocean-facing spa and fitness centre, 60-metre pool, beachfront wedding chapels and seven dining venues. Bali’s heritage and craftsmanship is reflected in the hotel’s design, a result of the joint efforts of award-winning architect Budimann Hendropurnomo and highly-acclaimed interior designer Rudy Dodo. Longevity Wellness Worldwide Longevity Wellness Worldwide recently announced the opening of the 5* Longevity Health & Wellness Hotel, which is due to open in June 2019 in Alvor, Portugal. This state-of-the-art wellness centre is the first of its kind embracing modern integrative and regenerative medicine with the most advanced wellness and preventative diagnostics, therapies and programmes. A ground-breaking, adults-only health and wellness property set in the western Algarve with panoramic views of the bay of Alvor, the property will offer world-class dedicated wellness and medical spa over 2 floors focused on a full array of medical and non-medical state-of-the-art diagnostics and therapies for optimal health and wellness. The hotel will have a total of 70 bedrooms and suites offering standard Longevity rooms, junior suites, Longevity thematic suites and 1 premium Longevity ‘The One’ suite.